Believe it or not, we are getting ready to ship the Summer 2019 release of MakeCode for the micro:bit! Thank you to everyone who helped us identify bugs and suggest new features. And also, a big Thank You to our translators and proofreaders who have helped us localize into 26 different languages! If you are the type of person who puts in pre-orders, goes to the opening night of a movie, or tries out brand new restaurants, then please start using the beta and tell us what you think! Also, the micro:bit Foudation is encouraging folks to join in their testing program. Go to the testing page to sign up and help out. Functions with parameters – Hooray!!! This was one of the most requested features from educators. Now when you make a function, you have the option to add Text, Boolean or Number type parameters. Try out the Edit Function feature and let us know what you think! 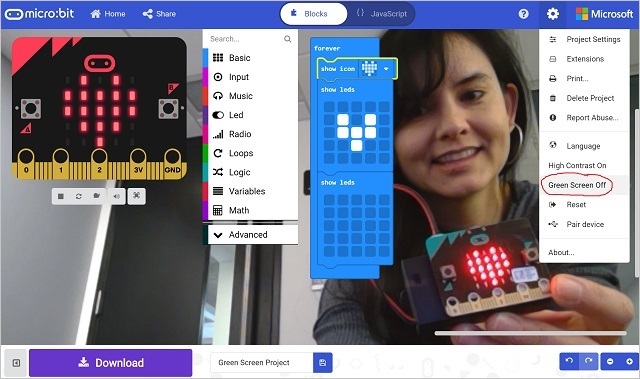 Green Screen – For those of you who do screen recordings as part of your lessons, this is a cool new feature that will allow you to overlay your webcam onto the MakeCode workspace. Wow, you can demonstrate code and hardware at the same time! You can access the Green Screen from the Project Settings menu. My Projects view – Also one of the top requested features – the ability to see all your projects, and then open, delete, and duplicate the projects. Tutorial Progress – We’ve added a way to save your tutorial progress so, if you have to exit a tutorial in the middle, you can jump back in where you left off. Updated Servo blocks – For those of you using servo motors with your micro:bit projects, we have improved the blocks in the Servo extension to help you calibrate and better control your servo motors. Radio Received blocks – this has been a pain point for many teachers. Students will often manually rename the Radio Received values expecting the data types to change also. We are trying to solve this by using fixed names for the received values – so they will not show up in the Variables Toolbox drawer and you will not be able to rename them. Please take a look and let us know what you think. Note, all projects using the old radio blocks will still work. Convert to Text block – in the Text Toolbox category, we’ve had the Parse to Number block for a while now that allows you to convert text to Numbers, but we haven’t had an easy way to allow you to convert other values into text. Until now! 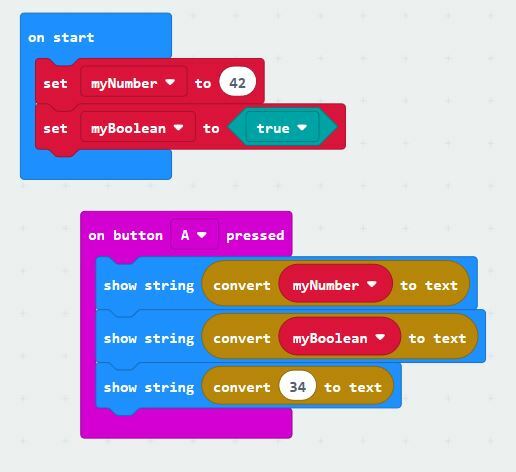 Introducing the Convert to Text block that can take numbers and Boolean values and convert them into text. So, if you’re super adventurous, you may find some additional goodies in the Experiments section of the site (if you can find it).